Makes the concrete or stone surface look like new. Frankly, we've been unable to find another rust remover that actually removes rust stains from concrete, except those that are so harsh that they remove the stain by also removing the concrete. Mix 3 Table spoons (1-1/2 ounces) of Rust Remover with 1 cup of water (8 ounces). My mother had accidentally put what she thought was “salt” (in fact it was Moss killer fortified with iron) on my driveway, I live in Vancouver B.C and we hardly ever get any snow but this winter the city had its share. The city had just poured a new sidewalk for me a year previous, so when I got home I saw what the ‘moss killer” did and left these nasty stains... I never thought anything would take the stains out, first attempt with a pressure washer did nothing! My mother found your site on the web, I bought your product and applied it to the side walk, it was a cool day so I let product sit for 45 mins, used a stiff brush and a home gas powered pressure washer and couldn’t believe my eyes!! There still is a faint stain on one part and when I return home again this summer I will purchase more of your product and reapply it in that area. Defiantly will tell my friends about Seal Green and a bonus is, that it is environmental safe. R.I.
Let me start by saying that the hardest thing about using this product is getting the top off of the tub. Good grief that was tough! Use a "coin" it said. Seriously? LOL. But once I got the top off, mixed this stuff up and smeared it on the multitude of liquid fertilizer stains left on my 2 x 2 white pavers by my lawn treatment company, it was PURE MAGIC. I had over 30 of these to clean and a couple required a second treatment...but the results are epic. I LOVE THIS PRODUCT! Quick results and performs as promised. THANK YOU! It works but takes a bit longer than expected, doesn’t remove all the stain but definitely helps. Will be buying more. I used this product to remove the iron stains due to fertilizer on my drive way concrete and it worked exactly the way it was advertised. Amazing product. Excellent product for removing Rust and other fertilizer stains. Started working as I applied the product. Used only a brush, had power washer as back up and did not use it. It is nice to buy a product that actually lives up to it's claim. I mixed a small batch in a plastic mixing cup and brushed it on the stained parts of the concrete and it practically disappeared before my eyes! Excellent product. This worked great, and it was easy! 10:57 - I tried several products to get the fertilizer stains off my driveway and nothing worked! SealGreen was amazing and I cleaned my whole driveway in about an hour!! Loved it and would definitely recommend it. 01:55 - Love it works great. 04:32 - This product is the only one I have found that will removed rust stains from concrete. I used exactly as directed and the rust stains were gone BEFORE I got a letter from the HOA. Thank you. 16:24 - Anybody who is dam enough to spray iron-containing fertilizer on their lawn and sprinkler water immediately after application, now have hope! 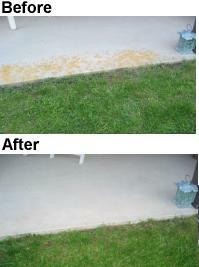 I was really worried as to how to remove rust looking stain on my concrete until I found SealGreen. This product really works with no side effect and spending time to clean it. I am happy now, the concrete stain is gone! Phew! 22:35 - I used the product on a large patio of paver bricks. I first pressure washed and removed algae and moss. The pavers were badly stained with lawn treatment leaving heavy iron spots. My patio looks as good as when it was first installed. I did what was advised in Youtube training videos, including using a drill stir from Home Depot for $5. Works as advertised, safe, no acids.